I like the process of knitting so I've learned to rip out mistakes when they occur and keep on stitching. I've taken apart completed sweaters if I realized I need to tweak the final pattern to make it fit properly. I'm always going to have a project on my needles, so I may as well ensure the final outcome is a success. I'm working on applying this same philosophy to my clay! Working in the clay medium can garner a roller coaster of emotions. The highs of success can quickly crumble in to the lows of disappointment. What I’ve learned on the journey through this particular art medium is to embrace the joys and to try to learn from the mistakes (after a few choice words are thrown about)! 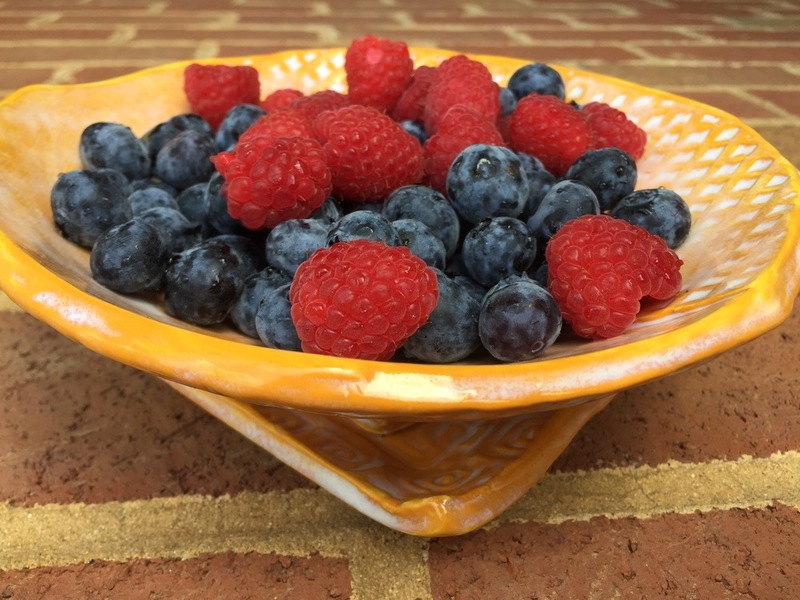 This is the latest generation of a berry bowl and drip tray I create. I've worked out the design over a couple of months by tweaking the shape of the split bowl and the size of the drip tray. The design has improved each time I make a new one based on what I've learned from previous tries. When clay is the artistic material of choice, there are many (many) times or stages throughout the creative process which can impede a successful outcome. Cracking, warping or breaking can threaten a piece even before its first of two firings. Glaze choice and proper kiln firing is also a key to positive results. Experience, time and practiced skills have helped increase my success rate with all of these hurdles over the years. But failure is still a possibility. Even when success is reached after all the creative stages are accomplished, breakage can occur through mishandling or shipping. Luckily, experience has taught me to roll with the punches. When I broke a piece of a finished totem this week as I was rushing and rearranging the stack for a photo, I went right back to the studio, remade the piece and tweaked the design to make it even better. Yes, I lost the time, effort and materials of the broken clay – but it is one of the consequences of the type of art I make. I’d be back in the studio making something anyway, so I learn and move forward. The very same day, I received a fantastic email from a customer. Her daughter has been inspired by some of my pieces in her own clay creations. That was just the news I needed to head back to the top of the roller coaster!